General Terms and Delivery Conditions. All Engineering-, Manufacturing-, Sales- und Deliveryactivity of AKIM AG are based on following Conditions. Offers that do not include a binding deadline are not binding. 2. Conclusion of an Agreement. An agreement is considered concluded, when we have accepted and confirmed the received order – in writing. Also verbal agreements are only valid, if they are confirmed in writing..
3. Scope and Completion of the Delivery. Our order confirmation establishes the criterion for the scope and completion of the delivery. Material or services, which are not included therein, will be billed separately. Construction changes compared with the order confirmation are permissible if the merchandise fulfills the same function. However, we do not have any obligation to undertake any such construction changes on merchandise already delivered. Call orders: Orders without fixed delivery date information must be called within one year of the order confirmation. Remaining stock, for which no call has been made after the expiration of this deadline, will either be delivered and invoiced or utilized in the best possible way while charging for all accumulated costs that are not covered. Technical documents, such as drawings, descriptions, illustrations, and the like are only considered as approximations unless they are expressly designated as binding; we reserve the right to make necessary changes. Technical documents are to be treated confidentially by the customer placing the order (hereinafter referred to as the customer). Such documentation remains our property and may not be copied or reproduced or made known to outside parties in any way or used to produce merchandise or components. They may be used for maintenance and operation. All documentation relating to offers, which do not result in an order, must be returned to us when requested. 5. Regulations at the Destination. The customer must make us aware of any legal, official and other regulations which must be heeded in the fulfillment of the agreement. Unless otherwise noted, our prices do not include valued added tax (VAT), packaging, shipping, insurance, assembly, installation and commissioning. a)	if a delivery extension has taken place for one of the reasons listed in section 9.
b) if the material or execution has undergone changes because the documentation provided by the customer did not correspond to the actual conditions or they were incomplete. c)	if the delivery deadline has been exceeded by 3 months. Our prices are not binding for follow-up orders. We reserve the right to make changes to the printed pricelists and catalog at any time. 7. Payment Terms and Conditions. Invoices are due 30 days from the invoice date. Payments are to be made according to the modalities on the invoice and in Swiss francs unless otherwise agreed. Cash discounts not agreed to in writing or mentioned on the invoice as well as other deductions to the invoiced amount, whether as the result of a complaint of defective delivered merchandise or other reasons, will not be accepted or recognized by us. If the customer does not meet the payment due date, it shall pay default interest without a special reminder from the time of the due date at a rate 5% above the prevailing discount rate of the Swiss National Bank. All collection charges shall be paid by the customer. The merchandise delivered by us remains our property until complete payment has been made for it, and we are permitted to place a lien on it in the Property Registry as long as payment has not been received in full. a) if the information we need to carry out the order is not received on time or if it is changed by the customer after the fact. b) if payment deadlines are not met. c)	if encumbrances occur that are outside our sphere of influence irrespective of whether these encumbrances originate with us, the customer or a third party. Such encumbrances may include but are not limited to epidemics, mobilization, war, unrest, strikes, significant operational interruptions, accidents, work conflicts, delayed or defective deliveries of necessary raw materials, semi-finished or finished products, official or other measures of any kind, transportation disruptions, or natural events. Any possible delays in our deliveries do not provide grounds for the customer to withdraw from the agreement or compensation for direct or indirect damages resulting from the delay. Punitive damages will not be recognized unless specifically agreed to in writing. When orders are cancelled, we are entitled to charge the customer for any costs incurred. Merchandise, which at the request of the customer cannot be sent after the expiration of the delivery deadline, will be billed by us. Further, section 7 applies. The storage of merchandise is at the expense and risk of the customer. 11. Checking and Accepting the Delivery . The customer shall check the delivery within 10 days after receipt and shall immediately inform us in writing of any possible defects for which we are responsibly on the basis of our contractual obligations. Shall he neglect to do so, the delivery shall be considered as approved. If the delivery shall prove to be not in compliance with the agreement, the customer shall return the merchandise to us immediately at its own expense and risk for the remedying of the defect. Further customer rights relating to defective delivery, in particular damage claims and withdrawal from the agreement, are excluded. 12. Transfer of Usage and Risk. Usage and risk are transferred to the customer with the departure of the delivery from the plant, at the latest, and even when the delivery is made franko, cif, fob or under similar clauses. We shall undertake at our discretion to repair or replace all parts of our delivery, which evidently become damaged or unusable as a consequence of bad material, erroneous construction or defective build at the written request of the customer during the guarantee period. 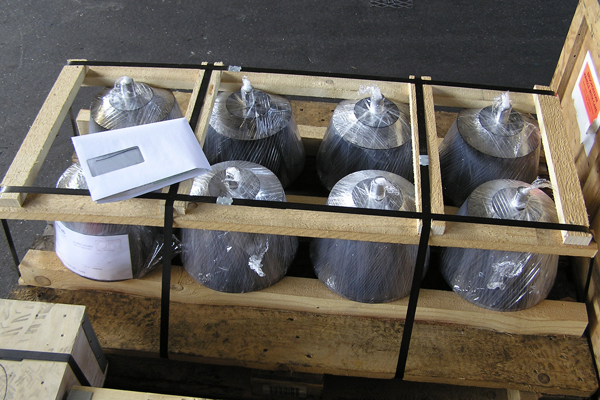 For this, the damaged or unusable parts are to be sent to us freight free. Replaced parts become our property. If the customer demands that the guarantee work under section 13.1 be carried out at the site of the merchandise, all additional costs shall be borne by the party making the demand. Further customer rights from faulty or insufficient delivery, in particular damage claims and withdrawal from the agreement, are excluded or governed by the terms and conditions of a possible insurance policy. The guarantee period is 12 months from the date of the invoice. For replaced parts, the guarantee period begins again; the maximum guarantee period ends 24 months after the date of the invoice. Excluded from the guarantee are damages resulting from natural wear and tear, improper or incorrect maintenance, disregard for operation instructions and requirements, incorrect operation, excessive loads, substances unsuited for operation, chemical or electrolytic influences as well as other reasons, which we do not have to support. The guarantee becomes void if the customer or a third party makes changes or undertakes repairs to the merchandise without our written approval or if the customer does not take appropriate measures to prevent the damage from becoming greater. If the customer does not assert certain claims resulting from the guarantee in writing before the expiration of the guarantee deadline, we are relieved of our obligations under the same. 14.1	Repair deliveries and returns are to be delivered (free domicile, incl. customs) for us free of charge and will only be accepted upon prior agreement. We shall undertake to carry out the delivery in compliance with the agreement and fulfill our guarantee obligations. Any further liability to the customer for any kind of damages is excluded. In particular, we are not liable for indirect or consequential damages, such as lost earnings or third-party claims. The courts holding jurisdiction at Altendorf/Switzerland, shall resolve all differences arising from this agreement relating to the customer and us. We also have the right to call the customer before the courts holding jurisdiction at the headquarters of the customer. This legal relationship is subject to Swiss law. These general delivery terms and conditions apply to all points, which are not mutually regulated in another way in writing. Special terms and conditions of the customer, which contradict these general delivery terms and conditions, shall only apply if we have expressed our agreement to them in writing. The official, legally valid version of these delivery terms and conditions is in German. Translations into other languages are not binding.